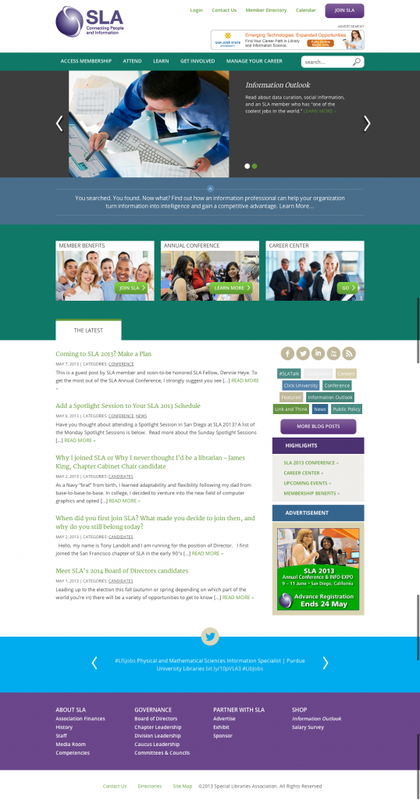 Special Libraries Association Launches New WordPress Website! The Special Libraries Association (SLA), serving thousands of information professionals worldwide, is known to consistently rejuvenate itself . The overhaul of its website would be no different. SLA teamed up with The Web Development Group (WDG) to modernize its online aesthetics, streamline the website user experience and simplify content management by moving to a WordPress content management system (CMS). SLA also required that members, as maintained via their Association Management System (AMS), would be able to view member-only content. You Have 99 Problems, But Your Website Ain’t One. To accomplish these goals, the site-map was reinterpreted for a tiered navigation (utility, main, footer) and clear calls to action were added to lead the industry’s professionals toward latest news, membership information and annual conference details. The information architecture and wire-framing was later re-imagined with an updated color palette inspired by the organizations branding. Custom templates were developed for landing pages, key events and third party services. Each component of the website was then integrated as a custom-designed WordPress theme empowering SLA staff to be able to keep the site current and dynamic. A custom WordPress plugin was developed to handle the aforementioned Single Sign On (SSO) capabilities. WDG initially leveraged cURL directly to communicate with Euclid Technology’s ClearVantage REST API. This approach was replaced with WordPress’ HTTP API functions and then systematically hooked into applicable actions and filters. Once enabled, the plugin allowed SLA members to securely log in through the WordPress website with their ClearVantage credentials. Their new site is launched and ready! 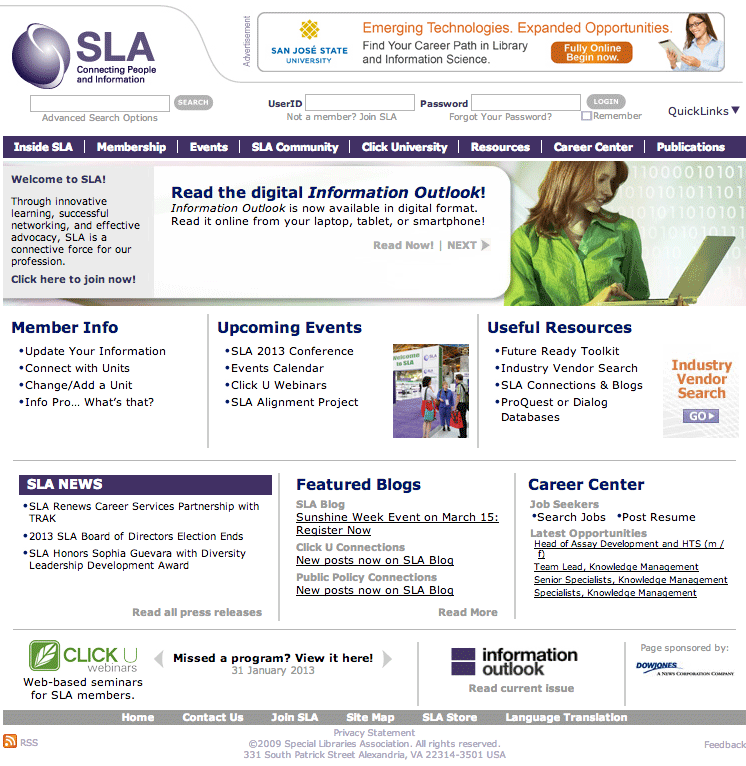 Check it out today: www.SLA.org. Welcome to the new SLA! Tell us what you think of SLA’s new WordPress-powered experience! WDG — The Web Development Group — is a leading provider of web design and web development servies enabling companies to engage across interactive channels such as web, email, and social media. WDG is located 5 miles from the center of Washington, DC in Old Town, Alexandria and was minted as Alexandria’s best small business. Contact us for web design and web development services.